We aim to bring you the latest news and information from Bere Regis Parish Council. The Parish Council meets on the 2nd Thursday of each month at 7pm in the Drax Hall. A Parish Councillor also joins Peter Wharf our District Councillor at the regular surgery he holds. This is at Turberville Court on the first Saturday of each month from 9.30 to 10 am. Useful information for the village, such as about libraries and bus services can be found here. For more information about the Parish Council and it’s role and responsibilities within Bere Regis see our About Us page. For a list of currently sitting Councillors visit our Councillors page. Minutes of the council meetings are available dating back to 1990 in the archives. Whilst the minutes from this year’s meetings are found here. The village of Bere Regis is built on the site of the Bere River, and (as of the 2001 census), has a population of 1,984. Located within the Purbeck District of Dorset, England, the nearest town is Wareham, only 6 miles to the South-East. 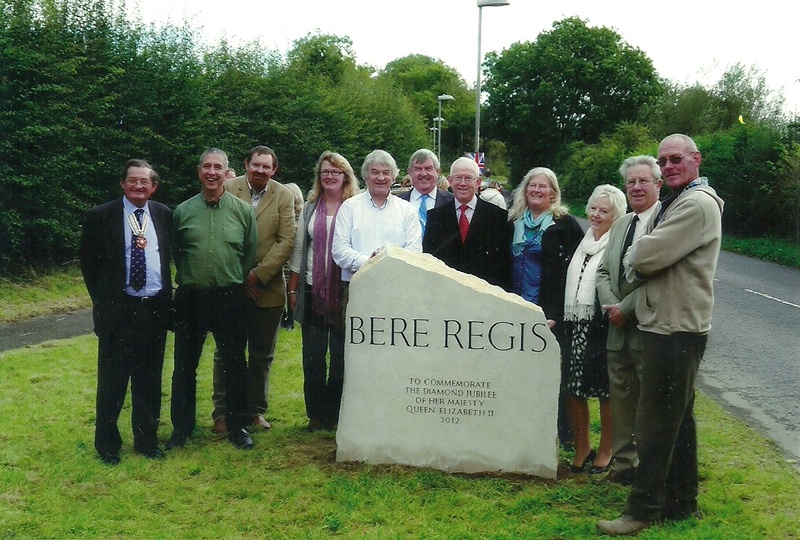 To celebrate Her Majesty The Queen’s Diamond Jubilee, the residents of the community of Bere Regis marked the occasion with the installation of new Purbeck Stone village signs. The signs were just one of many acts made by Bere Regis to celebrate the Jubilee. Bere Regis was featured in many of Thomas Hardy’s novels in the guise of ‘Kingsbere’. The village features notably in Tess of the D’Urbervilles, based on the Turberville family, whose roots originate in Bere Regis. The village website offers a fascinating insight into the family tree of this now extinct family name. A Parish Plan was designed to give local people the opportunity to engage with fellow residents, community groups, service providers, businesses and other organisations to set out a vision for how they want their parish or town to develop over a 5-10 year period. It is not a legally binding document but addresses all aspects of local life and used consultations within the community to provide a foundation for an action plan, which prioritises local issues, identifies key partners for delivery and sets target dates for the completion of actions. Between November 2004 and November 2006, some 40 parishioners from Bere Regis worked voluntarily to develop a plan for the Parish. The work was undertaken at the request of the Parish Council and with the support and guidance of Dorset Community Action as part of a wider, nationwide planning initiative. Furthermore, it was carried out independent of the Parish Council, under the terms of the funding, which came principally from the Countryside Agency. A copy of the full Parish Plan can be found by clicking the link: Bere Regis Parish Plan. From this a series of Actions were highlighted and these can be found by following the link: Bere Regis Parish Plan Action Points.